← Oh No!! What Did I Just Eat? During my current unemployment stint I’ve tried to stay away from the daytime television crap. I had watched an episode of “Jerry Springer” several weeks ago where two girls fought for their man’s love in a pool of bar-b-que sauce. While it did make for entertaining TV, I knew better than to make “Jerry, Jerry, Jerry…” part of my regular program viewing. Instead I stuck with shows from the History Channel, Discovery, NatGeo or anything ghost related. But yesterday Jake exposed me to the hilarity of what I was missing and I could feel myself being pulled into The Abyss. While I had heard about the Maury show, I couldn’t tell you the last time I had watched an episode. 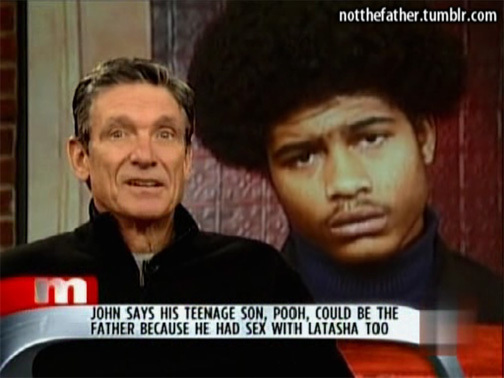 Maury is actually helping people out by giving them answers to questions, unlike Jerry Springer who just lets guests duke it out without offering much help. The episode we watched yesterday was all about helping women find out “who my baby daddy is” which seems to be a regular theme from what Jake was telling. Jake said that sometimes there will be 3-4 different guys on stage all nervously waiting to find out if they will be the lucky winner or loser depending on how you look at it. He said there was a time when a woman had 9 guys on stage and NONE of them were the father. Not only is the show a little “Jerry Springer” mixed with a little “C.S.I.” (paternity tests) but it also has a dash “Dancing with the Stars” as well because it turns out some of the “losers” get so excited they take to celebrating. Is this guy is REAL happy he won or lost? Then this morning I stumbled on the “The Steve Wilkos Show” and found myself running upstairs to get Jake. Me: This girl was trying to find out if this guy was her baby Daddy and said, “Why did you get his named tattoo-ded on you then?” Not tattooed, but tattoo-ded. We both started laughing as I turned on the show. The woman then proceeded to call the baby of the man’s current girlfriend all sorts of horrible names and even demonstrated how the baby looks. She didn’t even care when the crowd starting booing her after Steve read some of her nasty text messages. Woman: That’s right, I said it. Shore did. Umm-hmmm. My descent continued with an episode of Jerry Springer where a girl threw a sweet potato pie in the face of the girl who did unspeakable acts to her boyfriend, who was making a sweet potato pie at the time the act occurred. Seeing someone get hit in the face with a pie is funny. Seeing someone’s wig fly off their head when they get hit in the face with a pie is HILARIOUS, especially when you rewind it and watch it in super-slow motion like I did. That’s when I realized I had sucked into The Abyss… and that I need help. Gallery | This entry was posted in Daily Life and tagged daily life, humor, Jake, TV. Bookmark the permalink. Put the remote down and slowly move away from the television.